I. NEURONS are classified by the number of processes (Figure 5-1). A. Pseudounipolar neurons are located in the spinal dorsal root ganglia and sensory ganglia of cranial nerves (CN) V, VII, IX, and X. B. Bipolar neurons are found in the cochlear and vestibular ganglia of CN VIII, in the olfactory nerve (CN I), and in the retina. C. Multipolar neurons are the largest population of nerve cells in the nervous system. This group includes motor neurons, neurons of the autonomic nervous system, interneurons, pyramidal cells of the cerebral cortex, and Purkinjes cells of the cerebellar cortex. 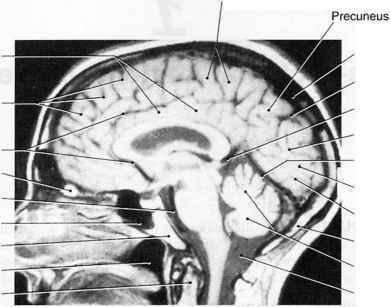 D. There are approximately 1011 neurons in the brain and approximately 1010 neurons in the neocortex. II. NISSL SUBSTANCE is characteristic of neurons. It consists of rosettes of polysomes and rough endoplasmic reticulum; therefore, it has a role in protein synthesis. 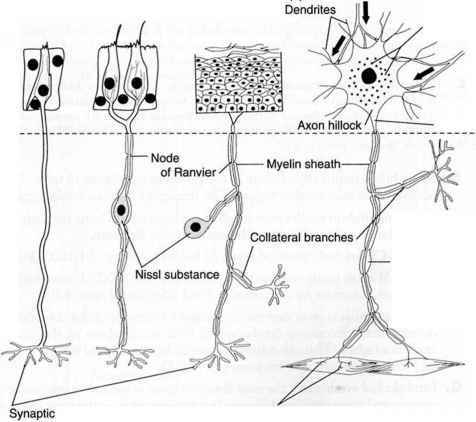 Nissl substance is found in the nerve cell body (perikaryon) and dendrites, not in the axon hillock or axon. III. AXONAL TRANSPORT mediates the intracellular distribution of secretory proteins, organelles, and cytoskeletal elements. It is inhibited by colchicine, which depolymerizes microtubules. B. Slow anterograde transport is responsible for transporting fibrillar cytoskeletal and protoplasmic elements. This process occurs at the rate of 1 to 5 mm/day. C. Fast retrograde transport returns used materials from the axon terminal to the cell body for degradation and recycling at a rate of 100 to 200 mm/day. It transports nerve growth factor, neurotropic viruses, and toxins, such as herpes simplex, rabies, po-liovirus, and tetanus toxin. It is mediated by neurotubules and dvnein. IV. WALLERIAN DEGENERATION is anterograde degeneration characterized by the disappearance of axons and myelin sheaths and the secondary proliferation of Schwann cells. 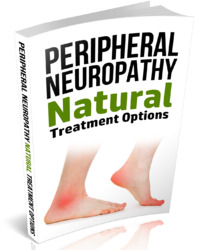 It occurs in the central nervous system (CNS) and the peripheral nervous system (PNS). V. CHROMATOLYSIS is the result of retrograde degeneration in the neurons of the CNS and PNS. There is a loss of Nissl substance after axotomy.